This tour takes you to three premier Tiger Reserves of Central Indian Highlands which gave inspiration to Sir Rudyard Kiplings - The Jungle Book. Covering Kanha, Pench & Satpura this is the perfect program to meet the Jungle Book characters in real. This program offers a good probability to sight Tiger, Sloth Bear, Leopard, Gaur, Barking Deer, Hard Ground Barasingha, Crocodile & many more mammals and birds. Satpura Tiger Reserve is spread over 1427 sq km and was formed in 1981 after joining Satpura, Pachmari and Bori sanctuaries. The altitude ranges from 300 to 1,352 metres (980 to 4,436 ft). The park is known for a variety of animals and birds including the tiger, leopard, sloth bear, crocodiles and over 300 species of birds. The terrain of the national park is extremely rugged and consists of fascinating deep valleys, sandstone peaks, narrow gorges, rivulets, waterfalls, thick dense green forest of Sal and mixed forest, it also has large tracts of Teak forests.Denwa Backwater Escape is located overlooking the mesmerizing backwaters of a dam built on Denwa River in Satpura National Park, the area is popularly known as Madhai. It is built on 10 acres of forested land along the river and across the river is the national park which is approached by a boat and then by jeeps to go deeper into the forest. The lodge offers stunning views of the Denwa River, grasslands across and rolling Pachmari hills. Day 01: Kanha National Park Arrive Kanha Earth Lodge for lunch. Evening village walk followed by an early dinner. Day 02: Kanha National Park Morning and evening jeep safari in Kanha Tiger Reserve. Day 03: Kanha National Park Morning and evening jeep safari in Kanha Tiger Reserve. Day 04: Kanha - Pench National Park After breakfast drive to Pench Tiger Reserve (3 Hours). Lunch on arrival at Pench Tree Lodge. Evening spend time in the in house organic vegetable & herb garden. Day 05: Pench National Park Morning and evening jeep safari in Pench Tiger Reserve. Day 06: Pench National Park Morning and evening jeep safari in Pench Tiger Reserve. Day 08: Satpura National Park Morning and evening jeep safari in Satpura Tiger Reserve. Day 09: Satpura National Park Morning boat safari or elephant safari in the National Park. Lunch followed by walking safari in the national park. Late evening game drive in the buffer zone to spot nocturnal wildlife. Day 10: Satpura National Park Post breakfast transfer for further connections. Tour cost: USD 1980 per person on twin sharing. Get 20 % off for travel between 6th January 2019 to 21stJanuary 2019. Four shared jeep safaris in Pench National Park with entry fees, jeep charges and guide charges included. Two shared jeep safaris, one walking or elephant safari, one boat safari in Satpura National Park & a late evening safari in the buffer zone. Journey through Kipling country which inspired Sir Rudyard Kiplings ‘The Jungle Book’. 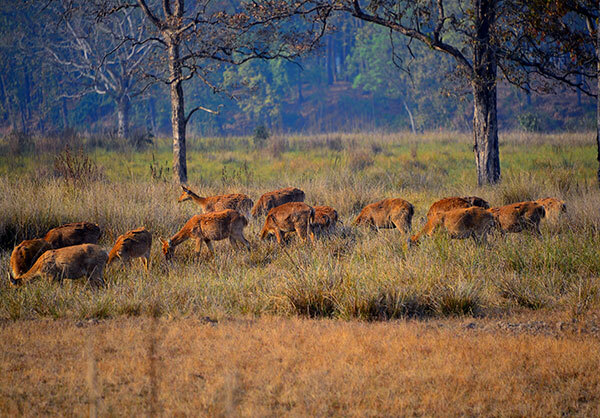 Kanha home to the last surviving population of Hard Ground Barasingha (Swamp Deer).